I have a friend who lives not far from me with an interesting yard. Her yard backs onto a nature reserve and when she had the house built she retained as many of the trees and shrubs as possible. (This is the same lady who had the Tawny Frogmouths nesting in her yard.) She has allowed the small grasses and shrubs to grow up as well and only weeds out the non-native species. She contacted me the other day to say that she had discovered some orchids flowering in the back yard and would I like to take some photos. 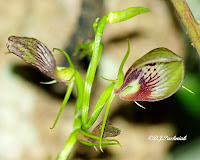 I always admire the beautiful orchids that Denis over at Nature of Robertson posts about. He has suggested to me that there must be similar orchids growing up here and I should try to find some. Little did I know the hazards attached to photographing orchids growing so close to the ground and under other vegetation! I got down on hands and knees and shuffled through the undergrowth to get where I could photograph the flowers. I got caught on a low branch and my shirt will never look the same again! When I stood up I found that the litter on the ground had scratched my legs and there was blood dripping from a number of places! The final problem was that I could not get the camera settings right and had to go back the next morning to do it all over again! 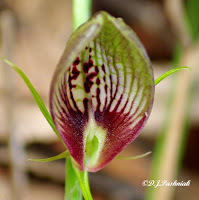 This time, however, I put on an old shirt and took a good big sack to put on the ground and save my legs from all the things that scratched the previous day.I sent off the photos to Denis for ID and he said it was a species he had posted about last January - the Bonnet or Tartan Orchid (Cryptostylis erecta). 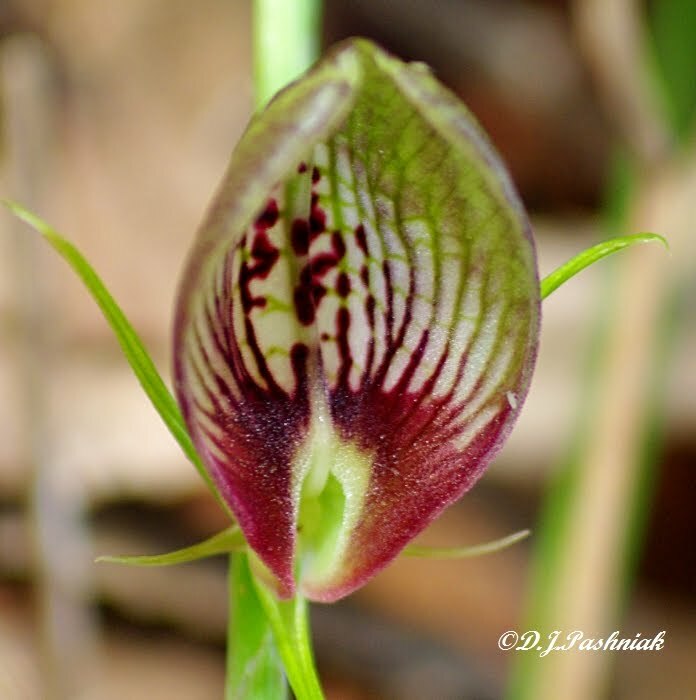 I did read that post and thought at the time that the flower was so distinctive that I would recognize it if ever I found it up here - but obviously you have to get your eye in for orchids! (Thanks for all the help Denis.) 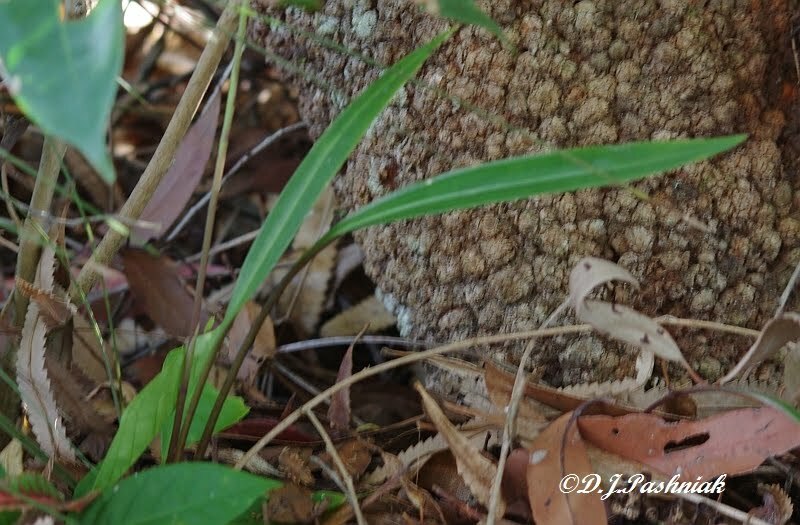 There were a number of these rather long leaves around the trunk of an old banksia tree. Denis says that each plant has only one leaf so there must be quite a number of plants growing close around the tree trunk. I looked for the purplish color underneath but found it showing only on the smaller younger (?) leaves. The flower stem had a number of buds at the end of the stalk but I could only see one flower open at a time. The flower is beautiful! I was surprised at the slight differences in color between the various flowers. I wonder if the color deepens the longer the flower is open. It seemed to me that the flowers which had just opened on the second day I was photographing were paler in color. P.S. I have a lot to learn about photographing orchids! There's nothing wrong with your photos. They're fine. Considerable variation occurs between flowers, and also the flowering season is very long, so you might find different depths of colour over the season. I always use Manual settings (small aperture) and flash on my Orchids. But your images are fine. Hi Denis, and thanks very much! I experimented with changing the aperture settings as well - plus the flash fired automatically. It's certainly different from photographing birds out in the bright sunlight with extra glare off the water! Very interesting about the variation in flower color. Thanks for all your help and suggestions. Lovely photos Mick - good post. Its fun taking close-ups, its a different world down there on the ground! Love the orchid. Great find! Thanks Barbara, its certainly different from taking photos of birds and will take a bit more practice I think. Hi Mosura, glad you know about all those things too - it seems much harder than sitting in the kayak and paddling off on the water! Yepp, getting Mother Nature up close can be a pain. These shots are lovely though. Like the colour of the orchid! Thanks Nicole. I definitely don't find the macro shooting as easy as shooting the birds at a distance. More practice should make it easier and I definitely want to be able to photograph little beauties like the orchid. Orchid hunters get the sack and stay on the job! Good for you. Oh Tony I do like your way with words! Thanks!! Hi again Nicole, I was using a monopod down as low as it was possible to fold it. I discovered some time ago that my hands are too shaky to do macro work without something to steady them :-( I shall have a look at some mini-tripods next time I am near a photo shop.